In the poetry workshop I taught this fall we talked a lot about repetition and variation. We agreed that repetition can be a good thing in a poem, like an engine moving you forward when you think you might be stuck. It worked for Dorothy: there’s no place like home, there’s no place like home, there’s no place…and she’s back on the farm, everything hunky and dory. But first, don’t forget, she had a little work to do: road trip, put together a crew, keep the crew out of the poppies, get the monkeys off her own back, steal the goods, incidental murder, dethrone the pretender, lost balloon. Or, as we call it in Pokey country, Another Effing Growth Experience. Or, if we go back to the poetry metaphor: Variation. Deviance. Mixing it up. So when Dorothy stands before Glinda, footsore, heartsore and having succeeded at a task no one believed she’d even survive, and Glinda bobs her head around like a marionette and says ever-so-sweetly: Why Dorothy, you’ve always had the power to go home, don’t you know that? 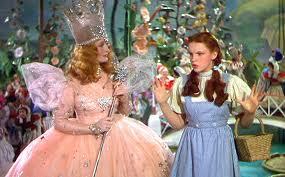 Does Dorothy smack Glinda upside the head with the broom and snap her shiny little wand in two? No. She doesn’t. Because frankly, my dear—Glinda’s got a point. 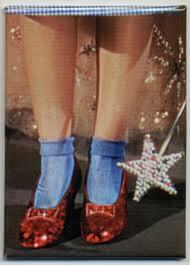 Dorothy had to want to go home. She had to want it. Over and over, until I did, indeed, question my existence and ordered begged him to stop. No, he’s not reading Sartre. At least not to my knowledge. I think he just likes the feel of those words in his mouth. It soothes him. It’s his mantra. He’s up in his kingdom fitting tiny Lego pieces together without a plan, practicing Negative Capability, breathing in and out these words that have come to him from…somewhere. And who is Pokey to deprive him of this clearly pleasurable activity when I myself have been known to get carried away at kirtan despite the fact that I know very few of the words and those I do know are in Sanskrit? Apparently, Pokey is all for repetition as long as she’s the one doing the repeating. Otherwise, Pokey would like to move on. As in, it’s 8:20. We’re about to be on time for school and I will not be late for work. All we have to do is get out the door. Some items are gathered up. A boot is put on. The dog is ridden like a pony. Attempt to locate snow pants. The plot from a book is re-told. Home work retrieved from kitchen table. Lunch box contents are examined. Name put on home work. Dog ridden like pony. Coat located. Gloves taken off to zip coat. Pokey breathes deeply throughout. She pretends the repetition is her mantra and at the end of this is enlightenment. She reminds herself that it’s better than it used to be. No one is crying. It used to be crying. Sometimes just him, but sometimes Pokey had to go stand outside the front door and whimper quietly to herself. Sometimes tears streamed down her face as she dropped her children off at school and drove away carrying the bad morning in her stomach like too many donuts. She remembers how painful giving birth was, and how this is so much better than that. Better than colic, better than not sleeping, better than tantrums, better than toilet “learning,” better than chasing a toddler around at parties where delicate, expensive things on low shelves ache to be touched. She knows this is just a new thing to learn, and then it will change, too. She reminds herself that they are making this moment together, Isaac and her, that it doesn’t belong to her alone. Isaac is ready, smiling. He tells a funny joke that isn’t really funny but he’s so happy in the telling of it and all of his clothes are on, his backpack is zipped and Pokey is smiling, too, as they make their way down the walk, almost on time, past the fort they made the other day when it was snowing and no one had to go anywhere and it was as if quiet was falling out of the sky with the snow and the snow held the quiet separate from the sound of their voices and their digging and fort-building, and it was easy to be happy with the progress they made which was not very much and therefore really quite considerable. I got to this post backwards from the VIDA one (also reeeally good, natch), but this one really moved me, brought me back to kiddo years past, had applicability to my now also, AND reminded me what an effing terrific writer you are, PM. Thanks for keeping at this. It’s good to have you back. Such a pleasure to read about Isaac, and Dorothy, and poetry, and the magical way you bring them ’round together. Missed you! thanks, yeah, it felt like that last paragraph was a gift.